Every year since I started working, I always challenge myself to give the most heartfelt gifts while still sticking to a budget. I always start preparing my Christmas gift list by late October or early November, so that I have more than enough time to research on what gifts to give with the budget I have. Lately, I’ve been so obsessed with giving personalized gifts, just because I like seeing the looks on people’s faces when they see their names printed on the item. 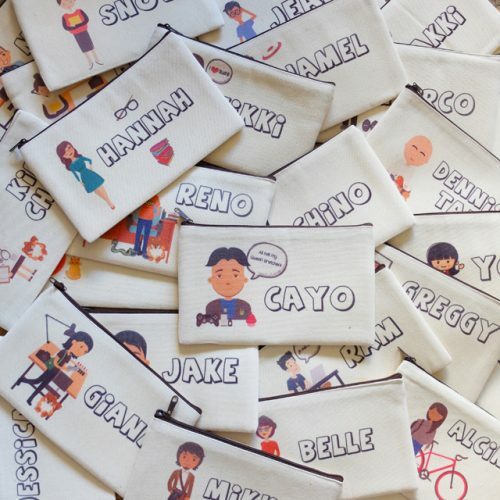 And while last year, it took me more than two weeks to design super customized pouches that were printed adorably by Myriad Print Concepts, this year I decided to order personalized necklaces from Istorya Creations for my girl cousins, close girl friends, and office mates. I stumbled upon them while visiting various websites and searching online, and it occurred to me that these past two years, I’ve saved myself the hassle of going to the mall to shop for gifts. Plus—I love supporting small, local businesses! I know this from experience, because my mom runs a small backyard business of making kesong puti, and I see all the sweat and hard work she pours into making her products by hand. Seeing Istorya’s pieces made me fall in love with them instantly—that I even ordered a necklace for myself! Each necklace came with a box already wrapped in gold ribbon and had a gift card, so I didn’t need to lift a finger either when it came to packaging my gifts. Aside from personalized necklaces, they also have key chains, dog tags, bracelets, and more! It’s really such a cute, creative, and affordable gift to give just about anyone. Have you guys heard of Istorya? Which products do you find the cutest? How much for the persolize necklace? Thanks in advance. How much for the personalized necklace? Thanks. Hi! I wanted to inquire. * How much would it cost me if I wanted to have a personalized necklace with 3 names? * Is there a silver necklace or it is only gold? * May I have a quote for both silver and gold necklace with 3 names? Hi, Anne! You can get in touch directly with Istorya at 09178942177.